3. Put garment into water pushing down so all of it is wet. 4. Gently swish about and leave for about 5 mins. 7. Repeat this process until suds are gone. 8. Place garment in a towel and wrap it up, gently rolling it so that some of the water comes out. 9. Unwrap & re-shape garment, pulling it into shape. Dry on a sweater dryer or for small items place on dry towel over radiator or clothes airer. Move around a few times as it’s drying. Last year at the Rare Breed Show at Singleton I purchased a Lleyn x Texel fleece. I washed some of it last year but the majority of the fleece joined about 8 more fleeces stored away in the barn. Yesterday I decided to do something different. 1.Remove any obvious vegetation & muck. 2 1/2 fill the bath tub with water just from hot tap & add a good squeeze of eco friendly washing up liquid. 3.Put some of the fleece in & swish it around, it needs room so don’t get carried away & put it all in! Leave for about an hour giving it an occassional swish. 4.The water should still be warm when you pull the plug, let dirty water drain away. 5.Turn the shower on warm to hot & spray the fleece until the water runs clear & soap is gone. 6.Put wet fleece into lingerie bags or pillow cases & pop into washing machine, spin. I use a 1000 setting. 7.Hang over clothes airer to dry & proceed with carding or spinning once dry. 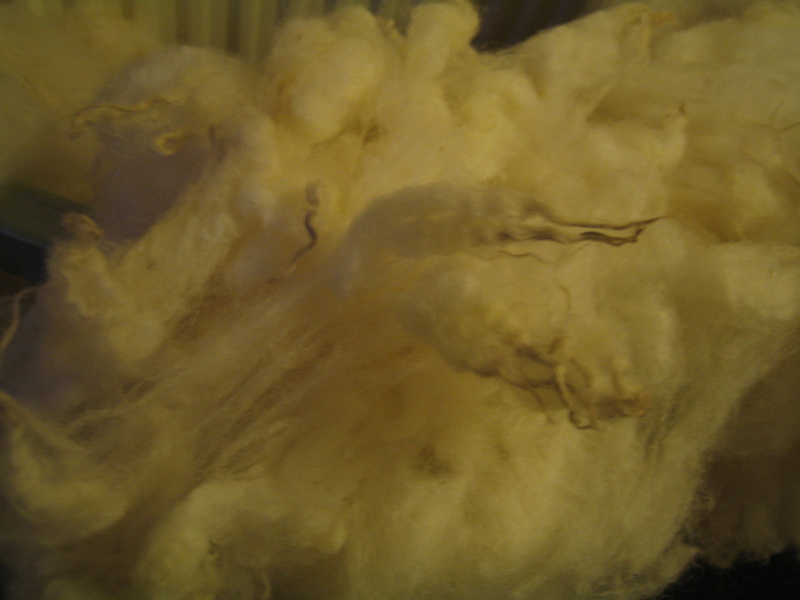 The fleece I washed had a staple of 5-6″ & had quite a bit of bounce to it, I would also wash longwool fleeces by this method but I don’t think it would suit merino type fleeces, they need a bit more TLC.